About a year ago I got an e-mail from Pam Buda telling me a little bit about this project and asking if I would like to participate. Would I??? This was right up my alley! She then called and explained a bit more and just like that I was hooked. The hardest part of this project was keeping it a secret until the actual club began. See Pam’s post (here) and The Marcus Fabrics post (here). I began making these tiny blocks and exchanging them with Pam and Janet (Rogue Quilter) and Cyndi (BusyThimble). I was nervous at first that my blocks would not be perfect enough for exchanging. I’ve seen how tiny Janet can go and I know how perfect Cyndi’s piecing is. But with Pam’s suggestion to spray starch (a method that is new to me) the fabrics and blocks, these went together (almost) perfectly. 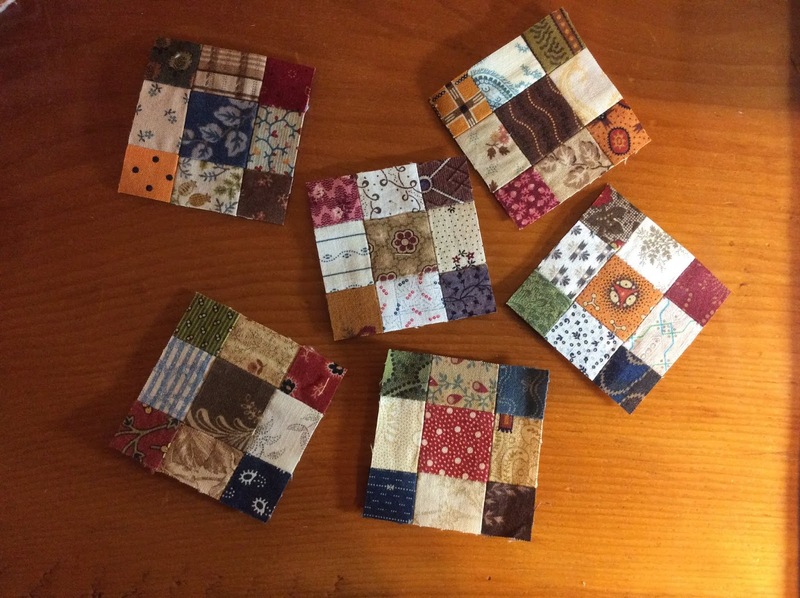 At first I was piecing them in strips in order to make 4 identical blocks at a time for exchanging. 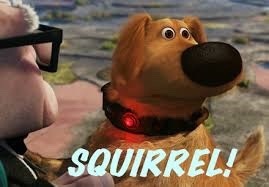 Now I am just using them as a feeder project. I am shocked at how many I can produce while making something else! the box is filling up! Of course Pam had to finish her quilt before the release of the pattern, but Janet has already started piecing hers together too. See her post (here). I'm going to take my time and see if I can exchange with a few more people before I start piecing my top together. 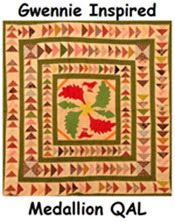 To find out more about the club and find a participating quilt shop near you, visit Marcus Fabrics (here). If you are lucky enough to live in (or near) Maine you can join at Cyndi’s shop (Busy Thimble). These blocks are so cute. Love the colors you are using. pretty tempting but with a humongous UFO list, have to pass...for now! 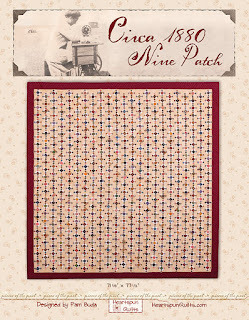 NIne patches have so many great ways they can be used!! 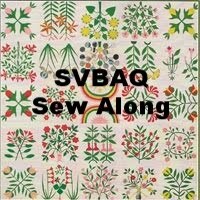 This quilt pattern is so exciting. 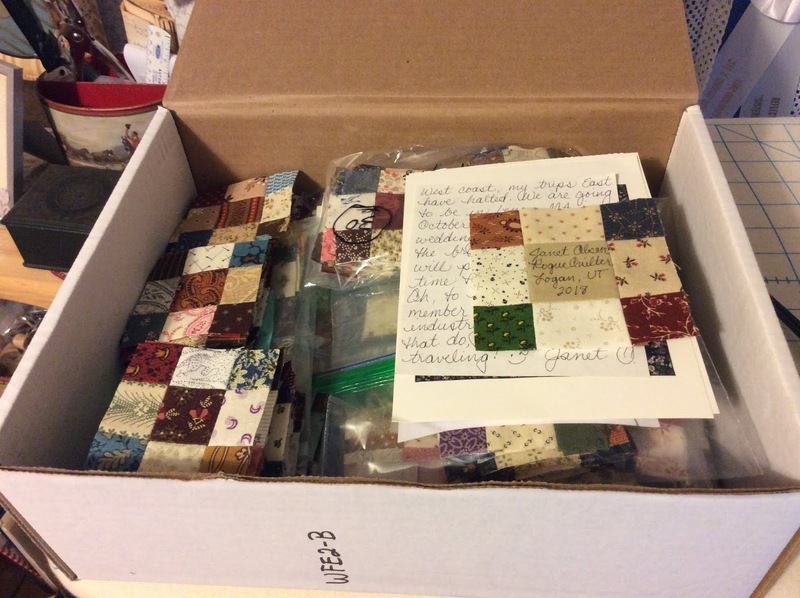 And the club is a true testament to the quilting community! If ONLY I had more time to participate! I am thrilled with how the rows are coming along on mine now, Wendy. Looking forward to our second club meeting this month. Hope many others will join in! Exchange? Did I hear the word "exchange"??? I'm in! I got my "kit" this week from Cyndi and I'm ready to go!! Yours are looking great. And BRAVO to you, Janet and Cyndi for keeping the secret. GREAT looking quilt! Wow! Lots of nine patch excitement. You all are going to have an awesome quilt when you're done. I just bought some of Pam's new fabric last week. It will be thrilling to watch how these all come together. Adorable blocks! I can't wait to see the completed quilt! such a great project. Love those cute little blocks and trading them is such fun! To wonderful for words - love the colors, the scale...well, just everything about this! How excited you must be to have hands on participation!! I just love this new project of yours! 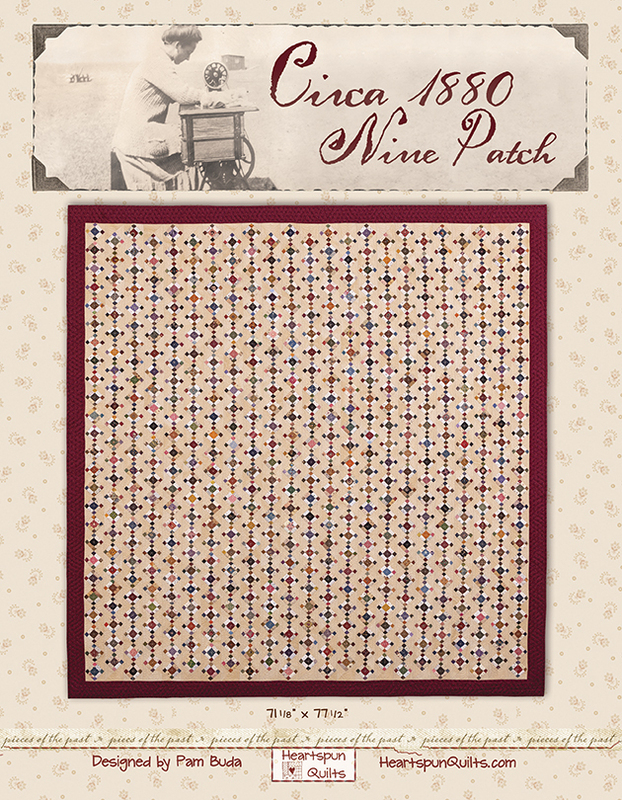 And those little nine patches are so cute. Can't wait to see more! This is a cool project. I love your tiny little blocks and swapping with other people sounds like a fun way to go about things. They make up into a stunning quilt.